. índice . Prefacio . Preface . . aguas . 1 . 2 . 3 . 4 . 5 . 6 . . contamina 1 . 2 . 3 . 4 . 5 . 6 . . holocausto 1 . 2 . 3 . 4 . 5 . 6 . 7 . 8 . 9 . 10 . 11 . 12 . 13 . . lineas 1 . 2 . 3 . 4 . . hidrotermias 1 . 2 . 3 . 4 . 5 . 6 . . nuevas 1 . 2 . 3 . . Reconquista 1 . 2 . . hidrogeo 1 . 2 . 3 . 4 . 5 . 6 . . esbozos 1 . 2 . 3 . 4 . 5 . 6 . 7 . 8 . . corredorcentral 1 . 2 . 3 . 4 . 5 . 6 . . cordones 1 . 2 . 3 . 4 . 5 . . epiola 1 . 2 . 3 . 4 . 5 . 6 . . deriva 1 . 2 . 3 . 4 . 5 . 6 . 7 . 8 . 9 . 10 . 11 . 12 . 13 . 14 . . archivo 1 . 2 . 3 . 4 . . Halcrow 1 . 2 . 3 . 4 . 5 . 6 . . frentehalino 1 . 2 . 3 . 4 . 5 . 6 . 7 . 8 . . emicampanaoculto 1 . 2 . 3 . 4 . 5 . 6 . 7 . . Costa del Plata 0 . 1 . 2 . 3 . 4 . 5 . 6 . . Costa del oro 1 . 2 . . IRSA 1 . 2 . 3 . 4 . . flujos . . segmentos . . pendientes 1 . 2 . 3 . 4 . 5 . 6 . . delta 1 . 2 . 3 . 4 . 5 . . propuesta . 1 . 2 . . correconvectivo 1 . 2 . 3 . 4 . 5 . 6 . . plataforma 1 . 2 . . termodinamica 1 . 2 . 3 . . Sagoff . . ABL 1 . 2 . . congreso . . girh . . Acumar 1 . 2 . 3 . 4 . . evaluacion 1 . 2 . . BocaRiachuelo 1 . 2 . 3 . 4 . 5 . 6 . 7 . 8 . 9 . 10 . 11 . 12 . 13 . 14 . 15 . 16 . 17 . 18 . 19 . 20 . . StoDomingo . . urgenciasatadas 1 . 2 . . inundabaires 1 . 2 . 3 . 4 . . sinsustento 1 . 2 . . emisarios 1 . 2 . 3 . 4 . 5 . 6 . 7 . 8 . 9 . 10 . . UAG 1 . 2 . 3 . 4 . . áreas nuevas 1 . 2 . 3 . . acreencias 1 . 2 . 3 . 4 . 5 . . audiencia 1 . 2 . 3 . 4 . 5 . 6 . 7 . 8 . 9 . 10 . . Valls 1 . 2 . . contrastes 1 . 2 . 3 . 4 . 5 . 6 . 7 . 8 . 9 . 10 . . convexterna . . playas 1 . 2 . 3 . 4 . 5 . 6 . 7 . 8 . 9 . . Plan Maestro 1 . 2 . 3 . . Parque Norte . 1 . 2 . . ribera . 1 . 2 . 3 . 4 . 5 . . jurisdiccion 1 . 2 . 3 . 4 . 5 . 6 . 7 . 8 . 9 . 10 . 11 . 12 . . CSJNpisamr 1 . 2 . 3 . 4 . 5 . . zonas muertas . . Bermejo 1 . 2 . . Pilcomayo . . Uruguay 1 . 2 . . Parana . . Areco 1 . 2 . . Salado . . Samborombon . . PuntaPiedras . . Tuyú . . PuntaRasa 1 . 2 . . PuntaMedanos . . Mar Chiquita 1 . 2 . 3 . 4 . 5 . . Mar del Plata 1 . 2 . 3 . 4 . 5 . . Necochea . . Colonia . . MartinGarcia 1 . 2 . 3 . . montesdelplata . . Puertos 1 . 2 . . formula1 . . disocio 1 . 2 . . senderos . . bajante . . . . oceano 1 . 2 . . hidrolinea 1 . 2 . 3 . . sustentable. 1 . 2 . . agua 1 . 2 . 3 . . hielo1300 . . antarticflows . . antarticmelts . . derrame . . luna 1 . 2 . 3 . 4 . 5 . 6 . . Trinidad . . prospectivas . 1 . 2 . 3 . 4 . . index . 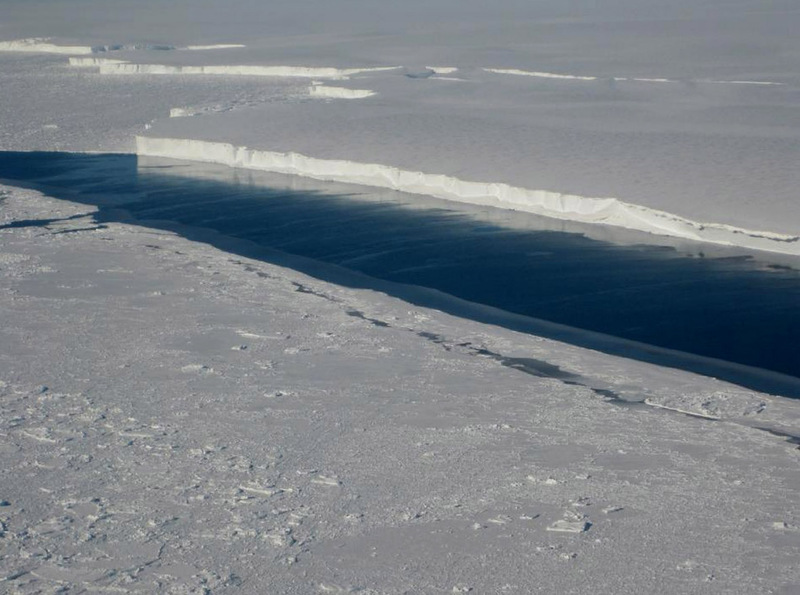 PASADENA, Calif. - Ocean waters melting the undersides of Antarctic ice shelves are responsible for most of the continent's ice shelf mass loss, a new study by NASA and university researchers has found. Scientists have studied the rates of basal melt, or the melting of the ice shelves from underneath, of individual ice shelves, the floating extensions of glaciers that empty into the sea. 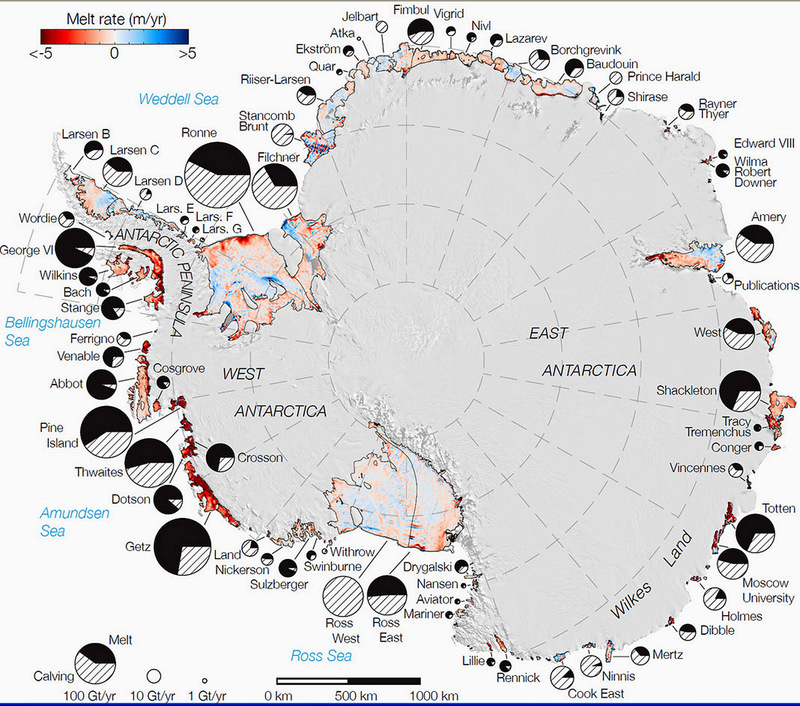 But this is the first comprehensive survey of all Antarctic ice shelves. The study found basal melt accounted for 55 percent of all Antarctic ice shelf mass loss from 2003 to 2008, an amount much higher than previously thought. Antarctica holds about 60 percent of the planet's fresh water locked into its massive ice sheet. Ice shelves buttress the glaciers behind them, modulating the speed at which these rivers of ice flow into the ocean. Determining how ice shelves melt will help scientists improve projections of how the Antarctic ice sheet will respond to a warming ocean and contribute to sea level rise. It also will improve global models of ocean circulation by providing a better estimate of the amount of fresh water ice shelf melting adds to Antarctic coastal waters. The study uses reconstructions of ice accumulation, satellite and aircraft readings of ice thickness, and changes in elevation and ice velocity to determine how fast ice shelves melt and compare the mass lost with the amount released by the calving, or splitting, of icebergs. "The traditional view on Antarctic mass loss is it is almost entirely controlled by iceberg calving," said Eric Rignot of NASA's Jet Propulsion Laboratory in Pasadena, Calif., and the University of California, Irvine. Rignot is lead author of the study to be published in the June 14 issue of the journal Science. "Our study shows melting from below by the ocean waters is larger, and this should change our perspective on the evolution of the ice sheet in a warming climate." Ice shelves grow through a combination of land ice flowing to the sea and snow accumulating on their surface. To determine how much ice and snowfall enters a specific ice shelf and how much makes it to an iceberg, where it may split off, the research team used a regional climate model for snow accumulation and combined the results with ice velocity data from satellites, ice shelf thickness measurements from NASA's Operation IceBridge - a continuing aerial survey of Earth's poles - and a new map of Antarctica's bedrock. Using this information, Rignot and colleagues were able to deduce whether the ice shelf was losing mass through basal melting or gaining it through the basal freezing of seawater. 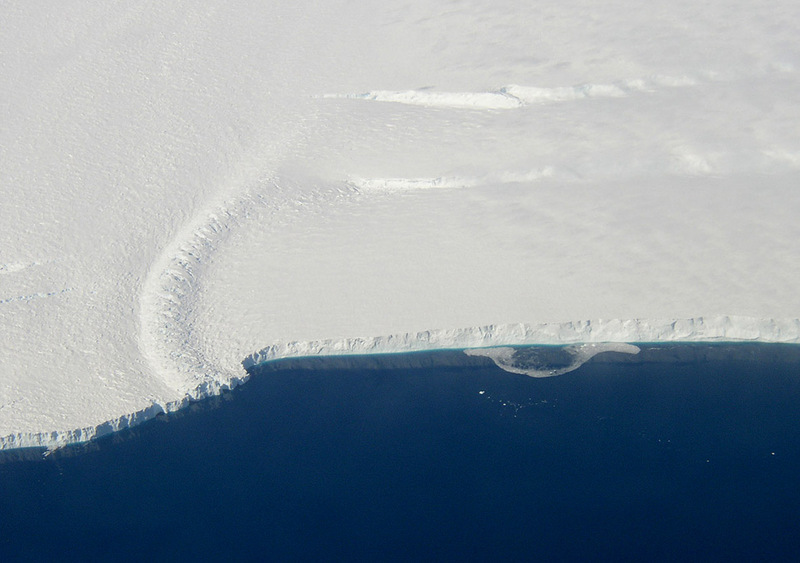 In some places, basal melt exceeds iceberg calving. In other places, the opposite is true. But in total, Antarctic ice shelves lost 2,921 trillion pounds (1,325 trillion kilograms) of ice per year in 2003 to 2008 through basal melt, while iceberg formation accounted for 2,400 trillion pounds (1,089 trillion kilograms) of mass loss each year. Basal melt can have a greater impact on ocean circulation than glacier calving. Icebergs slowly release melt water as they drift away from the continent. But strong melting near deep grounding lines, where glaciers lose their grip on the seafloor and start floating as ice shelves, discharges large quantities of fresher, lighter water near the Antarctic coastline. This lower-density water does not mix and sink as readily as colder, saltier water, and may be changing the rate of bottom water renewal. "Changes in basal melting are helping to change the properties of Antarctic bottom water, which is one component of the ocean's overturning circulation," said author Stan Jacobs, an oceanographer at Columbia University's Lamont-Doherty Earth Observatory in Palisades, N.Y. "In some areas it also impacts ecosystems by driving coastal upwelling, which brings up micronutrients like iron that fuel persistent plankton blooms in the summer." The study found basal melting is distributed unevenly around the continent. The three giant ice shelves of Ross, Filchner and Ronne, which make up two-thirds of the total Antarctic ice shelf area, accounted for only 15 percent of basal melting. Meanwhile, fewer than a dozen small ice shelves floating on "warm" waters (seawater only a few degrees above the freezing point) produced half of the total melt water during the same period. The scientists detected a similar high rate of basal melting under six small ice shelves along East Antarctica, a region not as well known because of a scarcity of measurements. 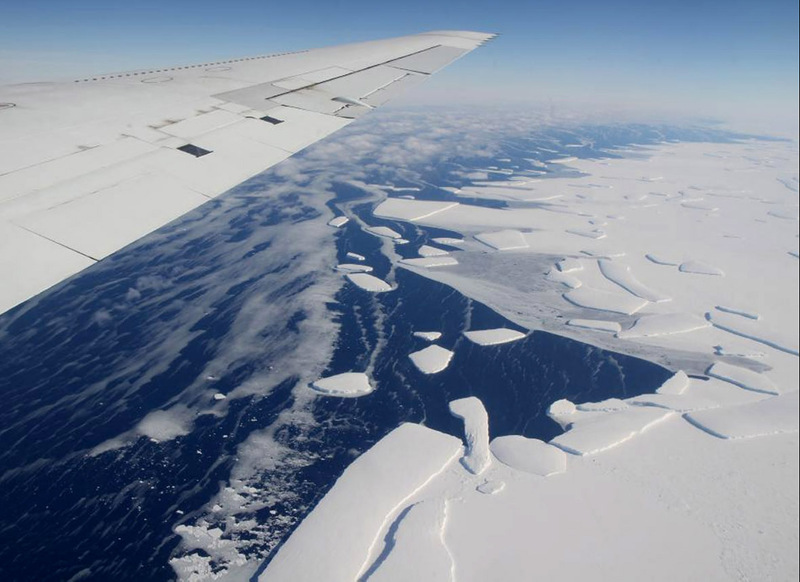 The researchers also compared the rates at which the ice shelves are shedding ice to the speed at which the continent itself is losing mass and found that, on average, ice shelves lost mass twice as fast as the Antarctic ice sheet did during the study period. "Ice shelf melt doesn't necessarily mean an ice shelf is decaying; it can be compensated by the ice flow from the continent," Rignot said. "But in a number of places around Antarctica, ice shelves are melting too fast, and a consequence of that is glaciers and the entire continent are changing as well." Imagery related to this release is online at: http://www.nasa.gov/topics/earth/features/earth20130613.html .